I was driving to the store specifically to get the rest the ingredients needed for my raw tabouli, when I heard on the radio someone talking about the fresh tomatoes in their garden. 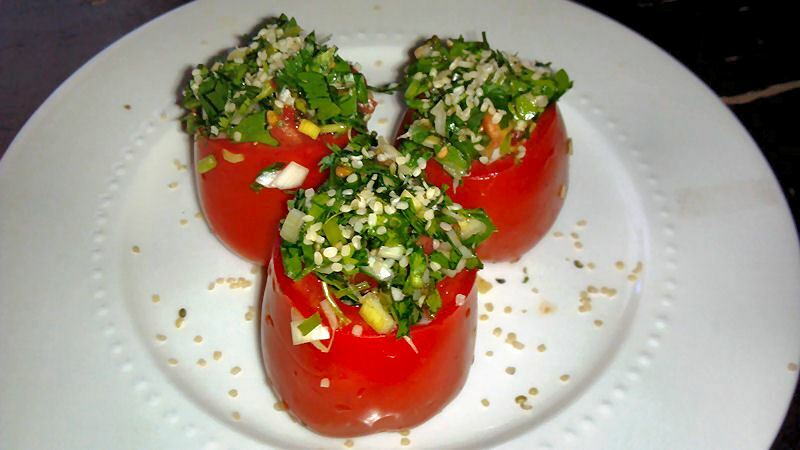 I thought, “How great would it be if I stuffed tomatoes with my tabouli! An hour later, here is the finished product! No added wheat or grains. Just pure, sweet, fresh, vegetables! 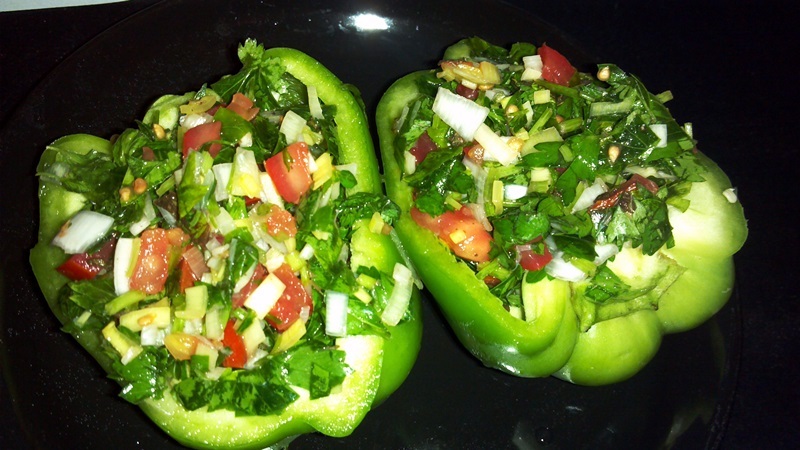 Finely chop the parsley, cilantro, mint, and garlic, then add to a large bowl. Take the leeks and chop off the bottom part. This will use that in replacement of onion, which is the usual ingredient. To me, leeks have a better flavor, not to mention excellent health benefits! Slice the leeks in half, then lengthwise, then chop them up into finely diced pieces. Add to a large bowl. Take 3 of the 4 tomatoes. Slice the bottoms off, leaving the top part where the stem is still on. This part is flatter than the bottom, which is easier to use for a base. Save the bottoms, as you can mix it with the tabouli salad. Scoop out the insides of 3 of our 4 tomatoes, making a hollowed out area for them to be stuffed. 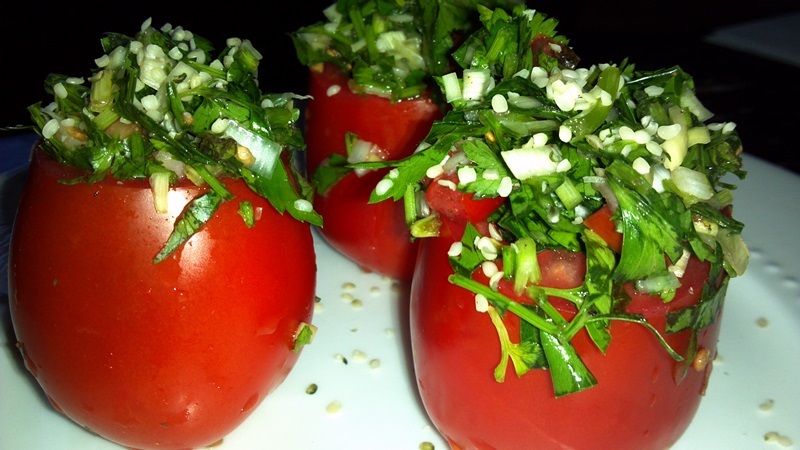 Chop up the extra tomato that is scooped out, and add that to the tabouli salad. Squeeze the lemon juice into the bowl, and add the salt and pepper and mix everything together. 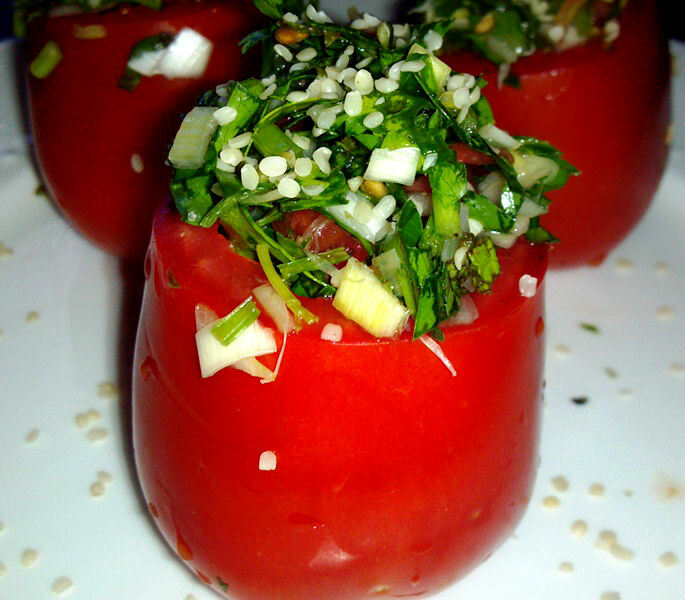 Take the hollowed out tomatoes, and stuff with the tabouli. Pack it in tight, so you don’t have any air pockets. 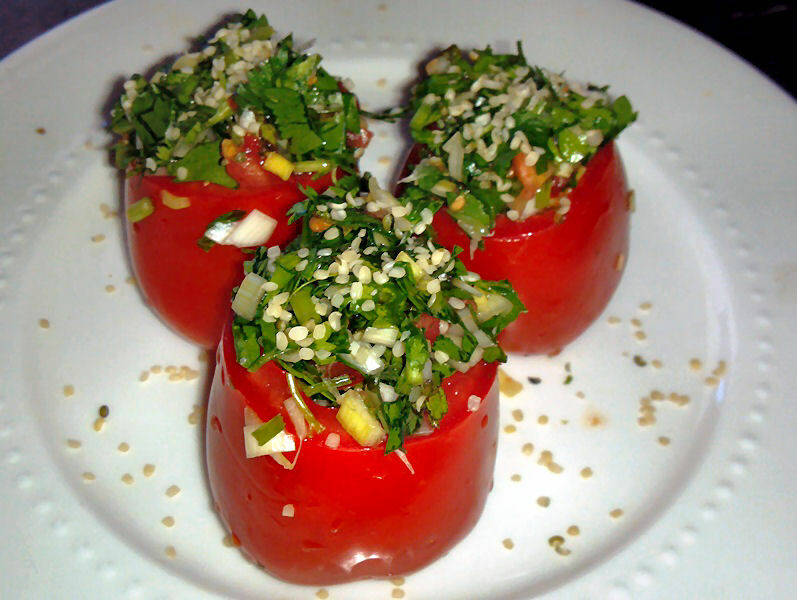 Sprinkle the tops with sesame or hemp seeds, drizzle with olive oil, and serve! View of the inside. If you get larger tomatoes, you can stuff them a lot more. 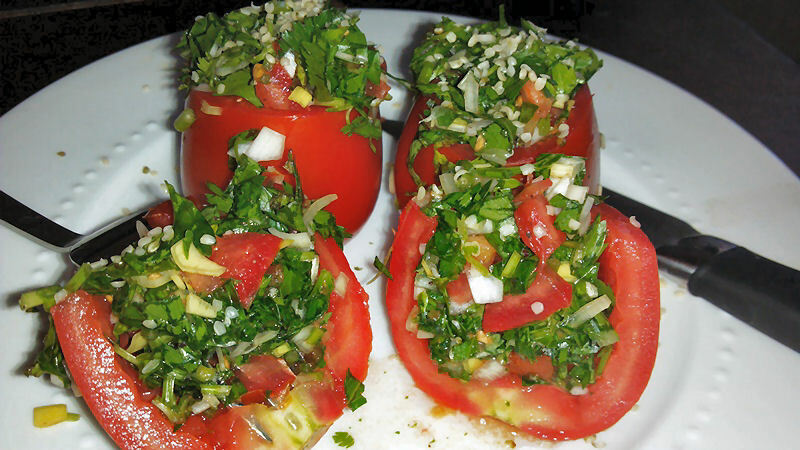 I had some leftover tabouli salad from the day before, so I decided to also stuff them into bell peppers for my dinner. They turned out great!